What is Slump of Concrete? 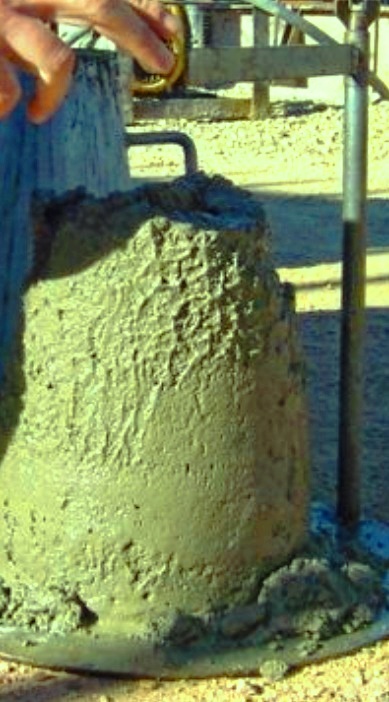 Slump test is a simple test to measure consistency of concrete (According to ACI 116R). It does not measure workability of concrete. It provides us warning about variation of uniformity of concrete mix for given mix proportion. This test method is done according to ASTM C143 and BS 1881: Part 102. The mold used here is 12 in (300 mm) high and the shape is frustum of cone. The mold is placed in such way that smaller opening is at the top, concrete is fed at top in three layers. For perfect compaction, a 5/8” (16mm) dia steel rod is used to temp (25 times) each layer. The steel rod should have rounded end. Top surface of concrete sample is stricken by saw and rolling motion of rod may also be applied. Smaller internal dia: 4” (102mm). The mold should place on smooth surface and should hold in such way that during entire operation no concrete come out through the base. Normally foot-rest or handle attach to the mold. When filling is completed, the mold is lifted slowly. The concrete loose support and get slumped. Actually concrete lose its height by increasing dimension of lower portion. It may even get collapsed depending on mix proportion. Now the value of slump is found by subtracting present height of concrete from mold height. This is usually measured to nearest ¼ in (5mm). The lifting of mold should be done just after filling, not to allow concrete to lose consistency. The surrounding area of the mold base is cleared so that no concrete or other foreign materials are left to resist slumping by widening of concrete base. Surface friction may hinder slumping of concrete; to reduce surface friction inside the mold and on the base, the mold and base are kept moistened before every test. According to British Standard, the slump is measured from highest point of concrete to mold ht. But ASTM standard recommended to use displaced original center. To determine behavior of cement paste under influence of different water-reducing admixtures or superplasticizers a mini slump test method was developed. But this test was developed for specific purpose. It should keep in mind that workability of concrete depends on many factors except flow properties of cement.